Krow’s having a bad day, I guess! But he kinda deserves like fifty years of bad days anyways, so whatever. First! Also, love. so much love for this page. Poor Krow, skulking behind the corner in the first panel. That comment made me snort Dr. Pepper all over my keyboard. Thanks. You wouldn’t happen to also read CAD, would you? Lackadaisy hasn’t updated in frikkin forever! Her pages look like they would take a while to do. I mean mine take upwards of like 40 to 50 hours a page and I’m not even fully painting them like she is. Also I believe she has a full time job on top of that. There are usually long waits between her updates, but, I dunno, seems worth it. Krow looks so horrified when he sees Phineas. Worried that he’s like a shark when blood is scented? The shapes and colors in the 2nd panel convey surprise really well. And I don’t wanna be “that guy” but what happened to Krow’s face scar in the last panel? oh, oops. Better fix that real quick. heh heh. Now no one will ever know. Doc’s shirt is going to be showing off his man cleavage by the time they get out of there, what with him being yanked around by it all the time. it’s gonna look like one of those gross v-neck shirts if he’s not careful! Anyways, love Doc’s reaction to his arm in the fourth panel. His face and body language is just gah, so cute. Haha. Doc’s reactions in general have been a fun contrast to Phin’s nonchalance towards this whole situation. All of the comments are in the future…!!! Or they’re in British time. EITHER WAY I am enjoying all of the Phin and Krow. alright alright, I finally set the time in wordpress. Let’s see if that makes any difference. hey, alright, it worked. You’re all on Mexico City time, now, boys. This is what we’ve been waiting for, I think! Krow and Phineas as Schtein’s henchmen, right? The gang’s all here! I was also hoping Jacob too, but I guess he’s the bad guy now. Oh well. And now, say tuned for Terrifyingly Threatening Bedside Manner with Phin! I should really not be this attracted to a cannibal. halp? Oh my god, it’s official. I love Krow (he’s just so pathetic and psycho). Jeez, every time there’s a new page, I just keep getting more and more excited! And the art just keeps getting more and more beautiful, too. That sure the hell doesn’t help at all. Phin is so buff. I’m noticing it now. Noticing that the serial killer is wicked buff. he benchpresses with weights made of human skulls. A lot of them. I like to think that Edgar is not so much in pain from Doc touching, but rather, that he is in pain because a freak like the Doc is touching him. For some reason I actually hope Krow is going to lose that arm…. Weird, but I kind of like the characters that are missing something. Laurence missing an eye, Phineas missing his sense of feeling pain…. Is that… blood dripping from Krow’s arm in the last panel? Ouch. The expressions here are great, especially in the last two panels. On a side note, with all the craziness going on, Schtein is starting to acquire a look of perma-horror. Not that I blame him. I find myself sympathizing for these characters, but then when I remember they’re murderers and psychos…I still sympathize for them. This is what that face says. I seem to be almost alone in wanting to see Krow get beaten to death by his own limbs. Stop killing yourself! Stop killing yourself! Stop killing yourself! 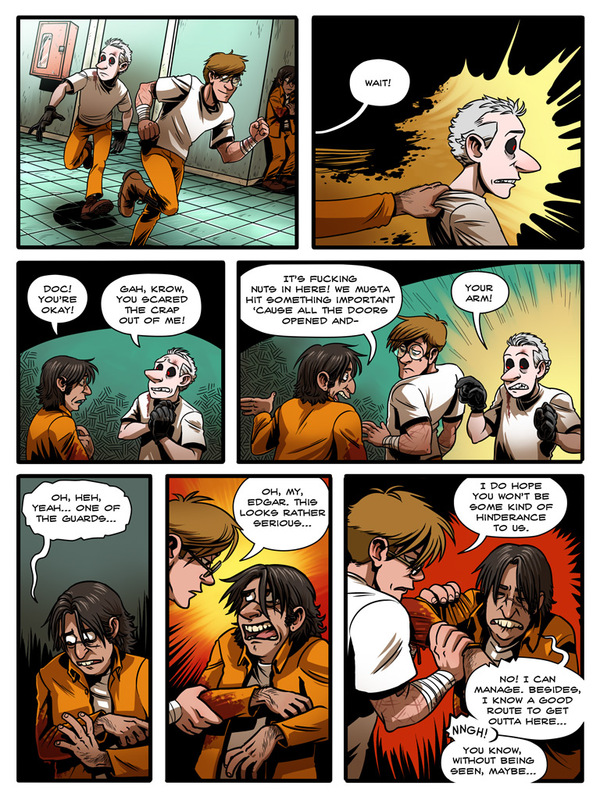 When I saw Doc reach for Krow’s arm I half braced myself to see him rip it off or something… and then I remembered.. oh yeah.. prison.. huge chaos.. this isn’t really a good ‘every man for himself’ situation..
Heh… I think Schtein is the only one who’s really acting normalin all this chaos (you know, as normal as someone in a middle of a riot in a prison, with guards everywhere trying to arrest you or kill you). I think what I like the most in your art is the way you pay attention to details. Like the blood on Schtein’s shirt (from the guard he stabbed), his chipped tooth (who got chipped when Drew hit him), his bruise (when the guard who Schtein stabbed push him against the wall and make him pass out), etc. Every detail hides a history, and you’re doing a great job not forgetting about them!